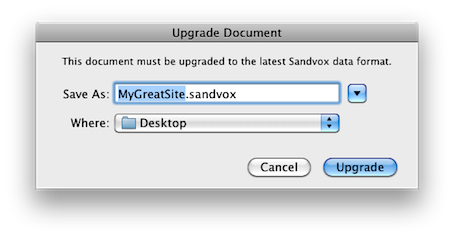 Your older Sandvox document will remain in place with the current, .svxSite file. You'll still be able to open it with the previous version of Sandvox if needed. So how do we move to Sandvox 2? When you first import a document into Sandvox 2, any custom HTML is left untouched. The site should continue to look as it always has. So what happens when you take one of these actions? Sandvox goes through the HTML making up the text. Each piece either gets cleaned up into neat paragraphs, or if Sandvox suspects the code might be custom, converts it to a Raw HTML object. From there you should be able to continue typing normally into the page, and/or edit the HTML objects. This logic by its nature has to be guesswork, so if you feel Sandvox is guessing wrong on a particular case, please get in touch with us using the Feedback Reporter, and we'll try our best to improve matters for you.